Blondie and Brownie: Go Upstate or Go Out East! These last few weekends of the summer are killer. Time to get that long weekend vacation is running out fast, but so are the opportunities for fun food events! Go away for one weekend and you miss the pig roast or the block party or the fancy ramen burger everyone's talking about! But what if you can combine your weekend out of the city with a fun food event? I've got two for you--one upstate and one on the East End--and both sound delightful. Both events happen next Saturday the 24th, and as much as I would like to go, I will most likely be out of town myself (to Virginia for one last weekend with the family before school starts.) The fancier event is Harvest East End at McCall Vineyards. 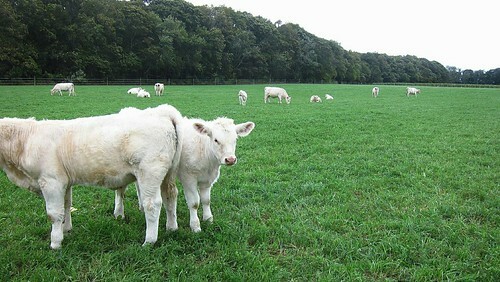 I had the pleasure of visiting McCall during my East End trip and I can tell you that it is lovely, right down to the snow white Charolais cattle. Tickets for the event, which is thrown by Long Island Wine Council so you know the wine will be tops, are $150 with the pricier VIP $250 tickets giving you advance seating and access to a private wine lounge. A full list of all the winemakers and restaurants participating can be found here, and tickets can be bought here. This is, of course, a charity event with some of the funds going to Peconic Land Trust--an organization I happen to love. This other event is more my speed (I'm just not fancy, guys!). 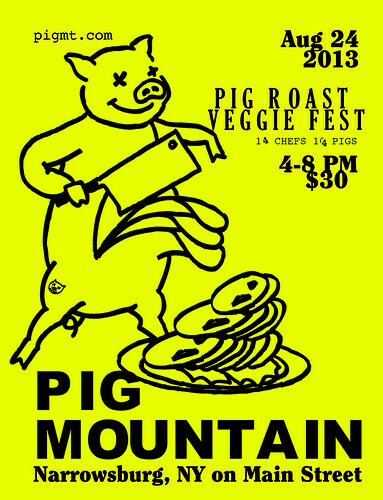 Pig Mountain is a $30 "pig roast and veggie fest" in quaint Narrowsburg, NY, right by the Delaware River in Sullivan County. The chefs are some of the country's best, the slideshow from past years makes me drool, and you can make a weekend of it doing all sorts of fun upstate things like visiting markets and antiquing (yes, that's a thing) and visiting farm friends. And you'll be supporting The National Young Farmers Coalition--another organization that makes me feel all sparkly inside! Click here to buy tickets.